I finally managed to update and upload my To-Do List Reference Application. 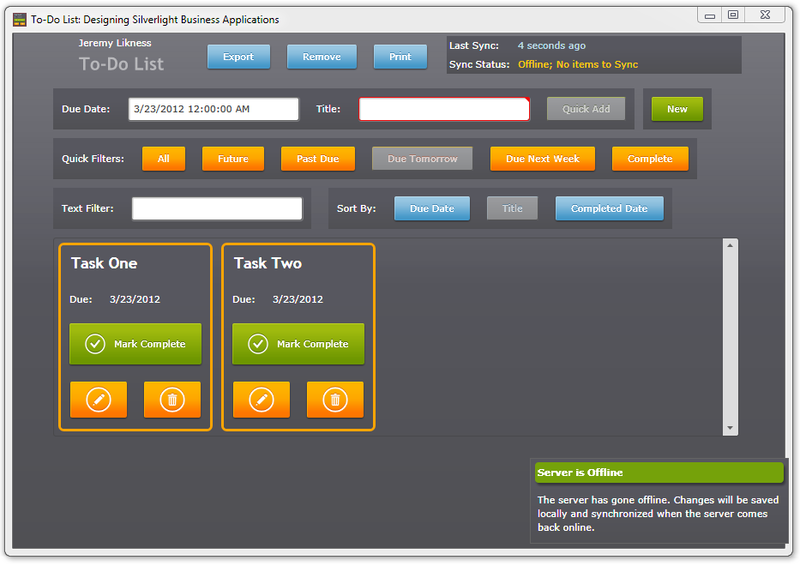 This is a Silverlight 5 application based on my Jounce framework that demonstrates a number of different features. 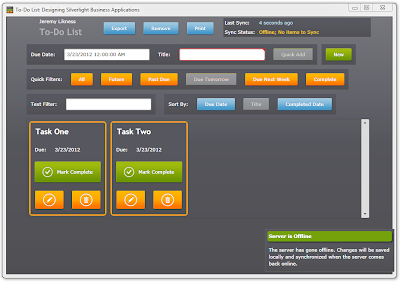 I built it as part of my book, Designing Silverlight Business Applications. There are several chapters devoted specifically to the construction of this example application. It is a demonstration application, so while it contains a lot of different components designed to illustrate various points, it's not intended to be a "production application." I won't even call it an "enterprise application" because it falls far short of what you might typically build for the enterprise, but this one has a lot more code than your typical two-page blog post program. I'm sure there are some items I left out. I hope this helps answer a lot of questions I receive and I also hope it is taken as guidance and an example, not a "final architecture" or production-ready module as again, the key intent is to provide examples of a lot of different features. There is only one thing I ask: that if you have questions about the application, you first invest in the book and ask me only if you don't find your answers there. Jounce is an open source community project and I'm sharing this example application as well, but the book is how I spent the better part of a year compiling all of the information I know about enterprise Silverlight development into one comprehensive resource. It's not a rehash of blog posts and contains a lot of content. However, if you've got the book, have worked through the examples and still have some questions or issues, please don't hesitate to contact me through the Jounce discussion forums or by replying in the comments section below. Simply head over to the Jounce website and click the download icon when browsing the latest source to grab the application. Thanks, and enjoy!